In 2011, in search of a vision statement that was accessible to the whole community we asked the children ‘what do Miss Frood and the teachers go on about?!’. 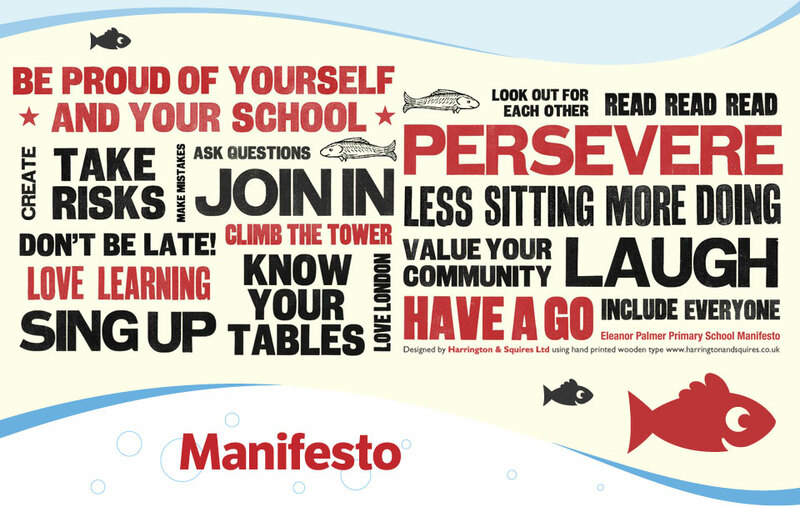 The statements on this manifesto are the result! The brilliant local design and print company, Harrington Squires, put it together in a ‘Keep Calm and Carry On’ style. We are delighted with this direct and simple way that we have created to communicate what we think matters at Eleanor Palmer. It is displayed on posters around the school, on T shirts and on postcards. We always do an annual parent questionnaire in June and consider feedback from parents. 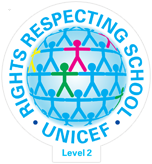 You can also register your views on our school at any point via the Parent View website. I have known Eleanor Palmer School for more than 20 years as a parent, governor and neighbour. It has been wonderful to see the school grow and develop into the exciting place of learning that it is now, which is testament to the talents and commitment of many people and particularly Kate Frood. It is truly at the heart of our community – serving, supporting and enhancing the life of those of us beyond the school gate as well as those who enter through it. Long live Eleanor Palmer! Eleanor Palmer is amazing and special. Everyone says so the minute they walk through the entrance. It is such a warm and vibrant place. My daughter joined Year 6 last year and it was like she had been plugged into a socket.I have never seen her so alive, happy and ready to learn. She loves this place and so do I.
Eleanor Palmer has helped my children develop a curiosity and self efficacy that is a joy to witness and is achieved by teaching that brings wonder, challenge and inclusion to every lesson. The place is alive with enthusiasm, fun and a contagious happiness that children carry with them beyond school. When our children say that they’re at the best school in the world we share their conviction! Maths, maths and more maths, that’s what I like! The best thing about Eleanor Palmer School is the inclusive nature of the place – and people! The best thing about Eleanor Palmer School is the happy atmosphere. Go there and feel a lift in your heart! Look at the children and see their bright faces and there you have it – a super school! As a Granny, I notice how friendly and kind everyone is. I was worried about my four year old starting school; he was happy in nursery and I had various concerns about reading and writing being taught too early. I took the camera with me on his first day, he was SO excited, I have a picture of him outside the school gate before we went; he was so proud and happy! Nearly a year and half later he’s still so happy and happy learning! His teachers have skilfully struck the perfect balance between learning and having fun. We are delighted! EP has proved to be such an amazing environment for our son to develop and learn on so many levels as well as allowing him to express himself both individually and with a wider sense of belonging. He loves going to school and we as parents have been able to plug in to the school community and make friends of our own. My daughter is now in Year Six and has been at Eleanor Palmer since Reception. She has been really happy all the way through and there has never been a day when she has not wanted to come. She has had a wonderful complete all round experience at Eleanor Palmer not just with the usual academic subjects but also including art, theatre, dance and music. The school is incredibly well led by an extraordinary team of hard working teachers and an inexhaustible Headteacher. I feel very privileged to be a parent at EP and I know my daughter will be really sad to leave come September. Eleanor Palmer’s warm and enthusiastic team has inspired a love for learning in my son, as well as a curiosity and awareness of the world around him. I always want to stay after drop off – it looks much more fun than my work! EP is the best school, I have ever experienced, I have 3 kids at 3 different education places.Staff are brilliant here from front line to back office. Communication is excellent, EP make you feel part of the community. As a working parent, ways of communication available for us is fantastic and evening events are brilliant. Best of all we parents are included in the process of decisions made i.e. after school play centre. EP has a Home Zone, which is unusual around other boroughs. Eleanor Palmer is a real community school where everyone knows everyone else. The teachers are always looking for creative ways to teach the children, taking them on some fantastic trips and getting people in to do things as diverse as drumming, Shakespeare workshops and building a Tudor house! It is a bright, attractive environment which has been created with the help of the children and of which they are very proud. Maths, a bug-bear for so many of us parents, is made to be a creative, fun subject, with games evenings. The administration of the school is amazing – you always know what is going on and when; I have an older child in private school and it just doesn’t compare! My son’s maths is so amazing! Cleans the floor with uncles, aunts and older cousins during family games over Christmas! At the school the children have some amazing opportunities, including music lessons with everyone getting a violin or cello to play from year 3. We have a wonderful teacher, Laura, who composes music for every school play! EP never stands still…always new inspiration; new initiatives; new ideas. My children are learning how to be part of change in such a constructive and forward looking way. We are new to this area, to London, to the UK…but we have been made to feel so very welcome. The staff’s enthusiasm is so infectious. At the winter carol concert, the whole school does a rendition of ‘The Twelve Days of Christmas’ with each class, the teachers, and the parents, all singing one of the ‘days’, all playing their different parts, to make a joyful whole that is so much more than the sum of the parts. It is a very touching symbol of the real sense of community and friendships across all the people involved in the school. My daughter (in Reception) loves school so much she is often disappointed at weekends that it is not a school day. One of the best things about Eleanor Palmer is the dedication and care of the teachers. My daughter loved the one-to-one reading sessions in Nursery. The fact that the teachers currently have the lowest absence across the whole of Camden shows how very dedicated they are! They seem to love their job and the children, and it really shows in how much work they put in to creating interesting classrooms and activities. Eleanor Palmer is a real heart of the local community. The children know children from across the year groups, and bump into each other at weekends. With events in school throughout the year, parents quickly get to know each other. I am amazed at the speed of my daughter’s progress in reading! EP makes learning fun and rewarding. Teachers respond to the individual level of each child to enable them to do their very best. When our children started at Eleanor Palmer, we became part of a community we hadn’t known existed it has changed the landscape of our lives in this corner of north London and as a young family, we feel truly fortunate to be a part of that.